I’ve got a serious case of ‘matcha mania’ at the moment. My obsession started back in April when Mr H and I visited Japan – you can literally get matcha flavoured EVERYTHING out there – and by the time I left I was totally hooked. For anyone unfamiliar with the stuff, matcha is essentially powdered green tea leaves, but because you actually consume the leaves (which is where many of the antioxidants are) rather than throwing them away as you would with a teabag, it’s heaps more powerful as well as being much more concentrated. So I’ve been putting matcha in everything from smoothies, to soups, to desserts and I’m SO excited to share this recipe with you. 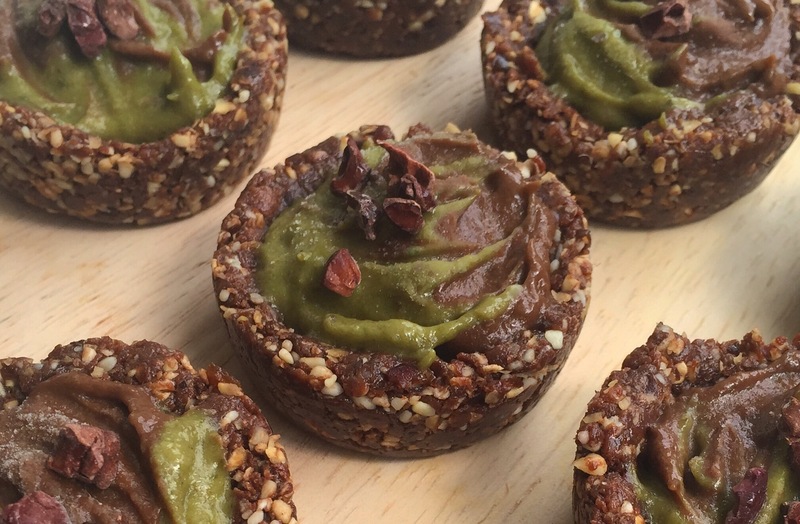 Not only are these cacao matcha tarts insanely yummy, but they are such an awesome energy-booster as they are full to the brim with superfoods and so much goodness. I made them using BLOOM supercharge matcha powder, which I would totally recommend as it also contains maca and guarana (both of which are known energy-boosters), so it basically gives you the same power-up as a coffee, but without a side of jitters or post-espresso energy crash. 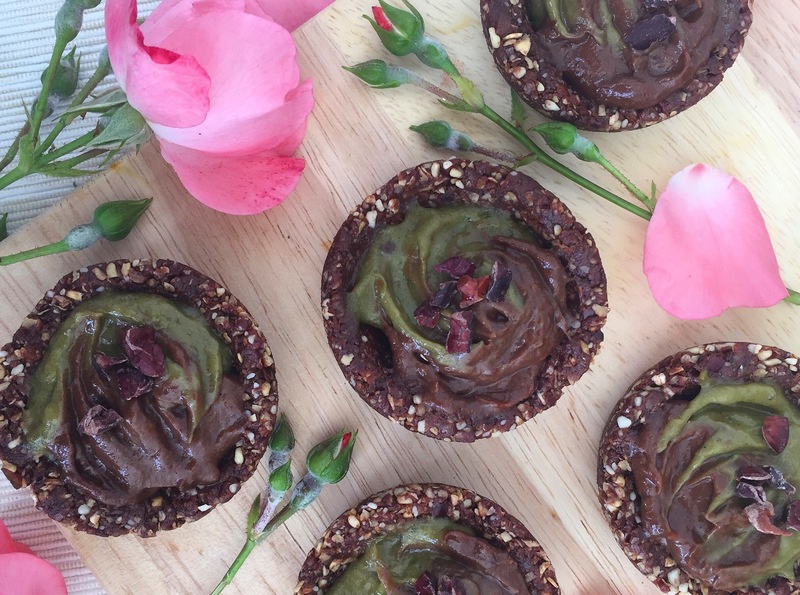 The tarts also contain cacao (which is known for being a great mood enhancer, plus it’s chock full (pun intended) of lots of lovely antioxidants) as well as oats, dates, cashews, bananas, avocado and coconut oil. These ingredients are packed with protein, slow release energy, good fats, fibre, vitamins and minerals, so when paired with my beloved duo of matcha and cacao, they make something quite magical! You might not think it for looking at them, but these tarts are basically an iPhone charger for your body – give them a try and you’ll be back up to 100% in no time! To make the crust, simply blitz the dates, oats, cashews and cacao powder in a food processor until they form a sticky dough. Press this into small tart moulds and pop in the freezer to set while you make the filling. For the filling, blend the dates, bananas, avocado and coconut oil in a food processor until they form a silky smooth mixture. Separate this mixture into two small bowls, and stir in the matcha powder to one bowl and the cacao powder to the other. Remove the moulds from the freezer and spoon a small amount of each mixture into the tarts. If you like, use a toothpick or a fork prong to swirl the two mixtures together slightly in the middle (it’s not essential but it looks pretty!). Top with cacao nibs if you fancy, then pop them in the fridge for an hour to set.